The tower on completion, with its new painted lime render finish, new Bath stone offset dressings, and reinstated pinnacles. The tower before work started, with its early C20 cement render finish. The tower clock was fully restored at the same time. 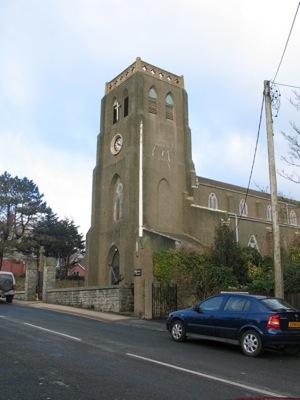 St. Katherine’s was constructed in 1803-8, one of the earliest examples in Wales of Gothic Revival architecture. While under construction, it was visited by Lord Nelson and the Hamiltons. 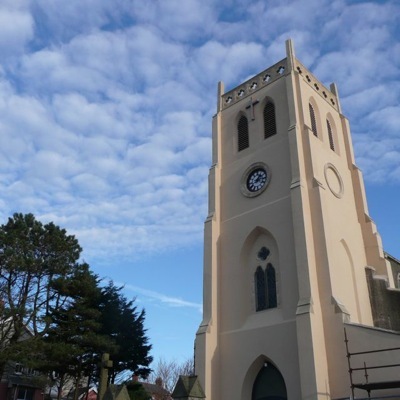 Having undertaken 3 preceding quinquennial inspections at this church, Frans Nicholas had the benefit of a detailed knowledge of the construction of the tower, and its behaviour over time. It was becoming increasingly damp as a result of ageing (and unattractive) C20 cement roughcast render, by then extensively cracked. The practice re-rendered the tower in 2009-2010 in lime render, finished with a silicate based paint finish. New stone weatherings were fitted to the vulnerable offsets on the buttresses. The existing Bath stone parapet was discretely strengthened, and missing pinnacles (shown on earlier photographs and C19 sketches) reinstated. 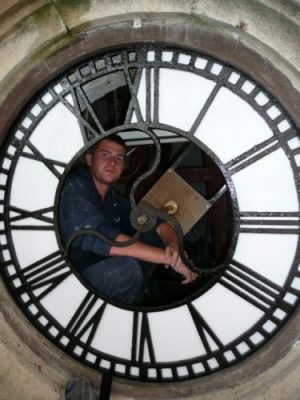 The opportunity was taken to conserve and repair the public clock in the tower while the scaffolding was in place. Many have commented that the outcome of the project has been to ‘lift’ the appearance of this part of Milford Haven: the tower a key townscape feature that was always designed to close off the end of Hamilton Terrace, the long main street of the original Georgian whaling town.